HODIE 2a vice lecta est Billa, touching Ordinances and Rules in Cathedral Churches and Schools. Item 2a vice lecta est Billa, for the Reformation of Excess in Apparel, que commissa est ad ingrossandum. Item 2a vice lecta est Billa, That no Bishop shall convent any Person for Abbey Lands. Item 2a vice lecta est Billa, for the Repairing of the Cawseye betwixt Bristowe and Gloucestre. 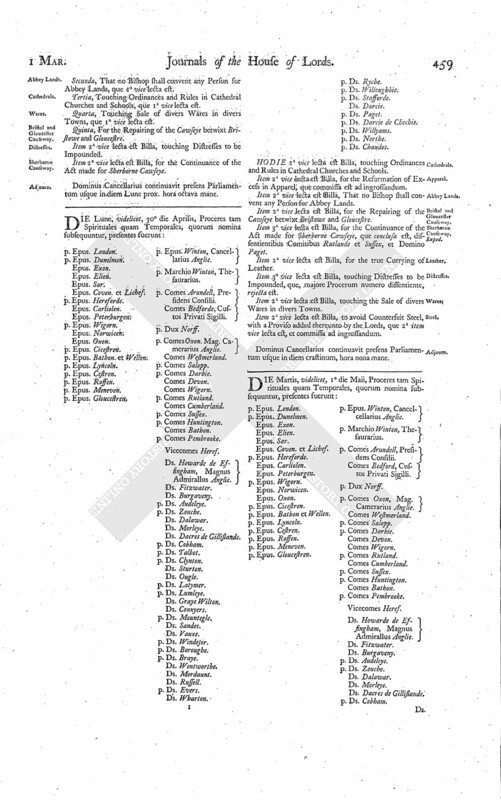 Item 3a vice lecta est Billa, for the Continuance of the Act made for Sherborne Cawseye, que conclusa est, dissentientibus Comitibus Rutlande et Sussex, et Domino Paget. Item 2a vice lecta est Billa, for the true Currying of Leather. Item 3a vice lecta est Billa, touching Distresses to be Impounded, que, majore Procerum numero diffentiente, rejecta est. Item 2a vice lecta est Billa, touching the Sale of divers Wares in divers Towns. Item 2a vice lecta est Billa, to avoid Counterfeit Steel, with a Proviso added thereunto by the Lords, que 2a item vice lecta est, et commissa ad ingrossandum.